When I’m craving sushi before a Penguin’s game or a show in the Cultural District, I typically get discouraged and table my sushi cravings for another night, because when I think of sushi, it usually means going to a Japanese or Chinese restaurant – neither of which are prevalent in downtown Pittsburgh. When I’m craving sushi before a Pittsburgh Penguins game or a show in the Cultural District, I typically get discouraged and table my sushi cravings for another night, because when I think of sushi it usually means going to a Japanese or Chinese restaurant – neither of which are prevalent in downtown Pittsburgh. Thus my mind passes over The Original Fish Market and Penn Avenue Fish Company – both which would also have access to fresh, high-quality fish on a daily basis. So before going to a recent Penguin’s playoff game, TasteBudA and I ventured into OFM and had sushi and beverages to gear up for the game. Heck – if you are going to watch penguins, why not eat like one! On the heels of going to Sushi Tomo, we had a fresh sushi mindset. Looking at the picture – you can see we ordered the OFM Roll with spicy tuna, avocado, cucumber(top left), Alaskan Roll with salmon, crab, ikura, tobiko (top right) and the Rainbow Roll with crab, avocado, and 5 types of fish. The OFM Roll at only $8 per roll was the highlight of the spread. The tuna was spicy, so I caution anyone sensitive to spice. The Alaskan Roll was good, but the texture of the roe wasn’t something I particularly liked. The Rainbow Roll was good, but not as good as the rainbow roll from Sushi Tomo. Our service was great and there was even an interesting table to people-watch. I recommend sitting in the area off the bar-section and not in the main dining room, because it is more bright and inviting. We had a nice time, and it wasn’t busy. 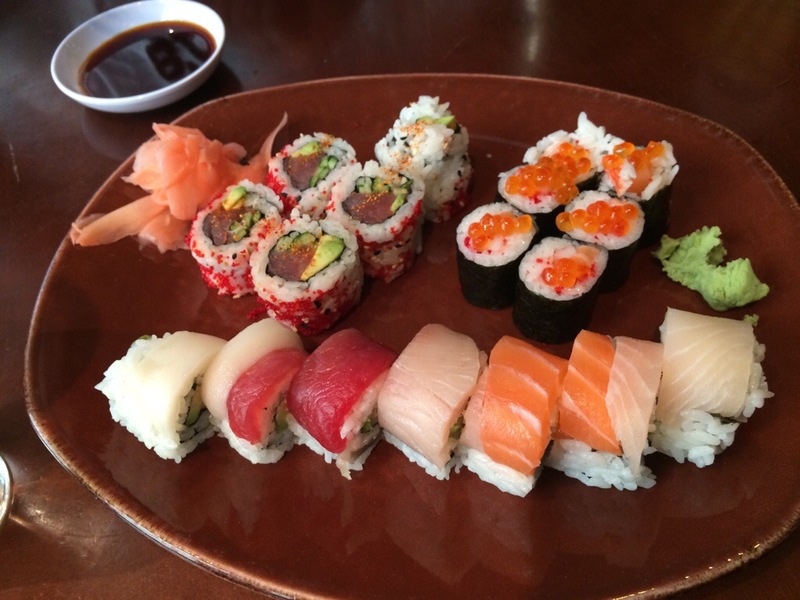 If I were in the area and in the mood for seafood, I would go back, but since Sushi Tomo is closer to home – it will likely be more of a go-to place for us. Previous Does Sushi Tomo have the best Sushi in Pittsburgh?